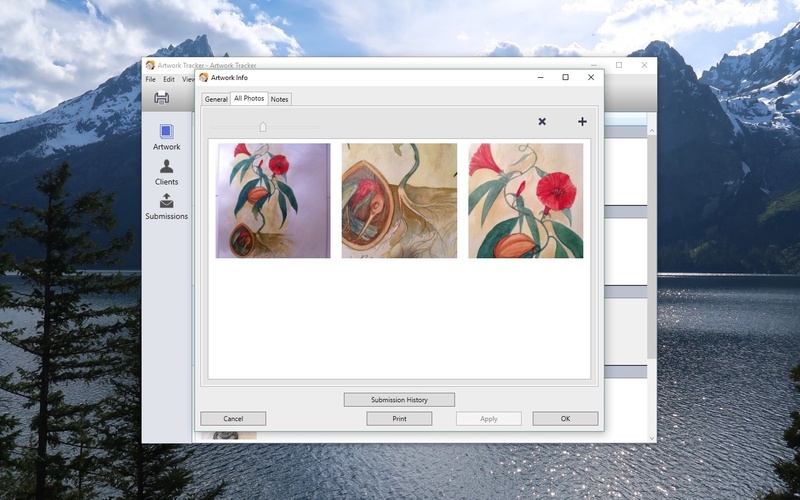 Track your artwork collection on your Windows PC! Artwork Tracker makes keeping track of your art collection easy. Never wonder again where or when you submitted your art. The information is all right there on your PC! 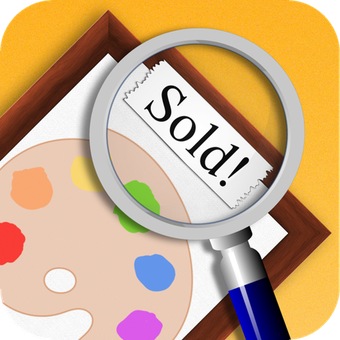 Whether you’re a working artist, a collector, or an art dealer, Artwork Tracker is a valuable addition to your artistic toolbox. Want to track your collection on the go? Transfer your database to and from Artwork Tracker on your iPhone, iPad, or iPod touch (available on the iOS App Store). Looking for the Mac version? Artwork Tracker for Mac is now available. 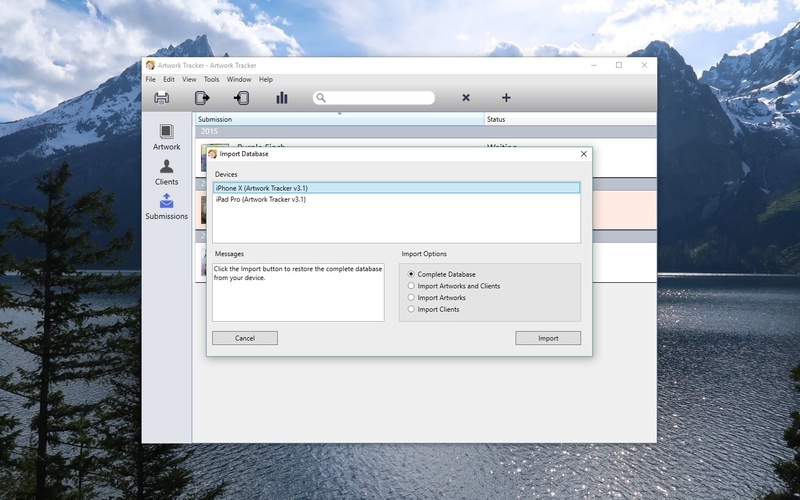 Windows XP SP3, Windows Vista, Windows 7, Windows 8, Windows 8.1, or Windows 10. Microsoft .NET Framework 4 with the KB2468871 update patch. The download version initially runs in an unregistered trial mode, limited to 5 artworks with 5 photos each, 5 clients, and 5 submissions. It will also only allow a single database window, and database import is disabled. 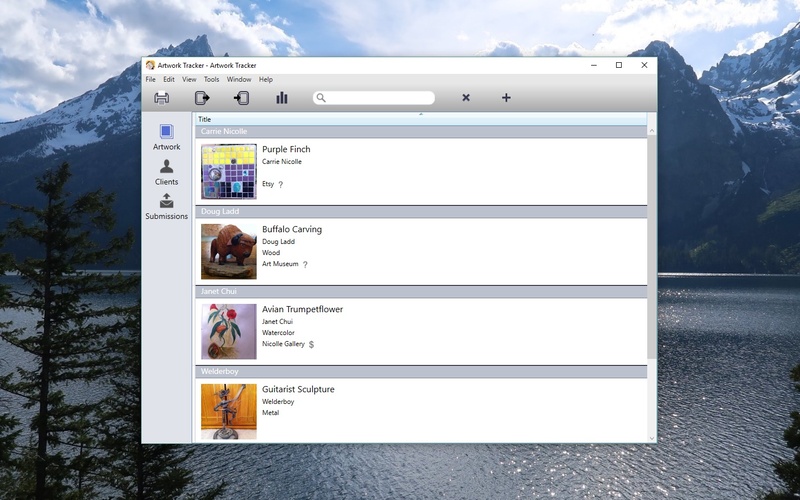 Record details about your artwork, including creation notes. 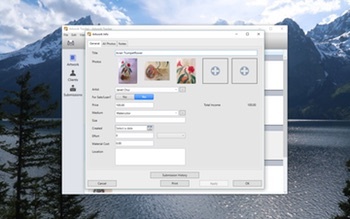 Add multiple photos per artwork. Store client details and record contact information. Track submissions for all your artworks. Record details and view response times for each submission. Response due dates are calculated automatically based on client response time and submission sent date, or can be overridden. Check the status of your artworks, clients and submissions at a glance. Use the search field to quickly search artwork, client, and submission lists. Sort artworks by title, artist or status, sort clients by name or status, and sort submissions by date or status. View total income earned for each artwork. View the submission history for each artwork or client, sorted by date. Clients approaching deadline are highlighted with a tinted background on the client list. Past due submissions are highlighted with a tinted background on the submission list. Print artwork, client, or submission lists, or information for a particular artwork, client, or submission. Database import and export over WiFi to Artwork Tracker on your iPhone, iPad, or iPod touch. 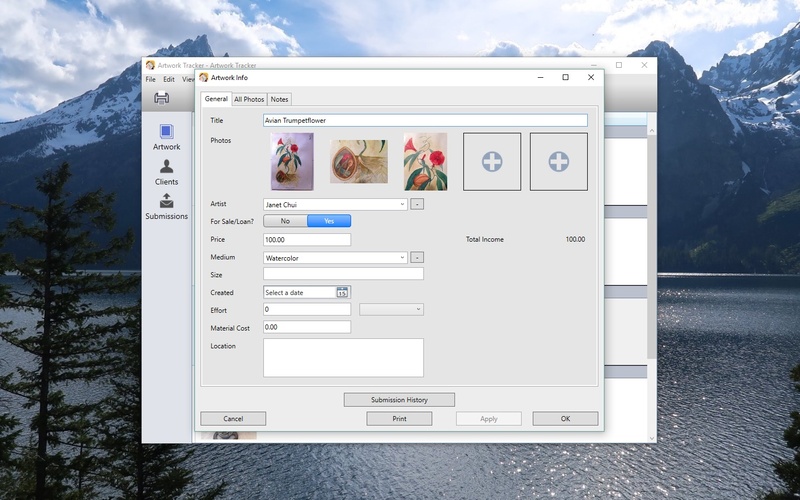 Import / export via CSV format to transfer your Artwork Tracker database to and from desktop spreadsheet applications. Artwork Report HTML export. 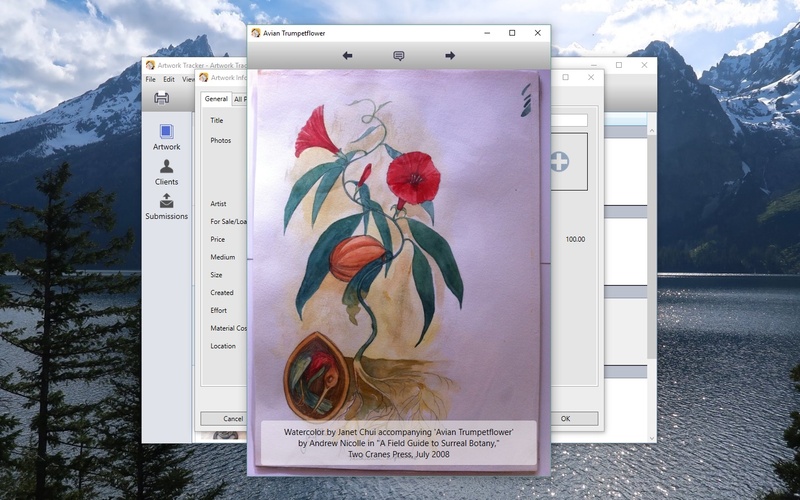 View your art collection on your computer’s web browser. Great for keeping track of your art for inventory or insurance purposes. Send me an email at if you have any questions, to request features, or report any issues. You might also want to check out the Artwork Tracker for PC Frequently Asked Questions (FAQ) page. Join the Facebook page to discuss Artwork Tracker with other fans.